Rice paper is a name for everything different products, including edible paper and decorative papers, including wallpaper. The edible kind, made from rice flour, is the white, translucent wrapper used for Vietnamese spring and summer rolls, chilled and raw or fried and hot. They can be used to wrap savory or sweet ingredients—or a combination. Here’s more about rice paper from CooksInfo.com. Asian ravioli (i.e., dumplings) with an Asian sauce or an Italian sauce (pesto or olive oil). Baked salmon in “parchment” (the rice paper becomes “edible parchment”—recipe). “Leftovers” rolls: proteins, noodles/pasta, salmon usually) and soba noodles, raw or cooked vegetables, grains, beans, legumes, etc. Salad rolls/crudité rolls, with your favorite raw veggies. Wrap “sandwiches”: curried chicken salad, smoked salmon, tuna salad, BLT (bacon, butter lettuce, halved cherry tomatoes). 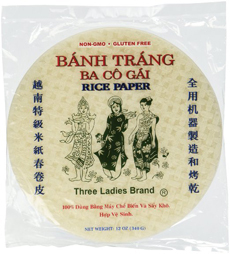 Some supermarkets carry rice paper in the Asian products aisle; or get them from an Asian grocer or online. 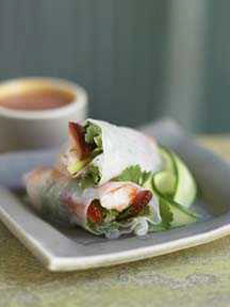 They may be called spring roll wrappers or spring roll skins. This is a fun dish made by each person at the table, like Moo Shoo Pork. We first had it at a Vietnamese restaurant in Paris in our late teens, and it was love at first bite: grilled beef and fresh mint wrapped in butter lettuce leaves with condiments. 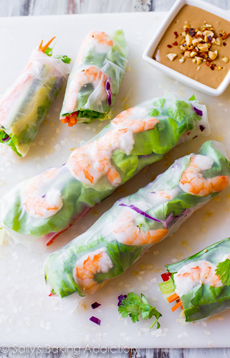 We’ve since added rice paper for do-it-yourself spring rolls. You can make them vegetarian or add a grilled protein of choice. Set the table with ingredients of choice. You can use them all (we do) or make a selection of five or so. Protein: grilled beef or tuna slices, shrimp, crab, etc. 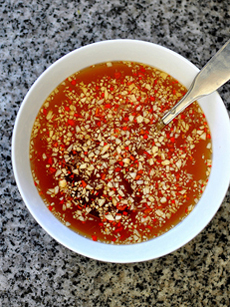 Dipping sauce: choose from Nuoc Mam Cham (recipe below), peanut sauce, chimichurri sauce (especially with grilled proteins), Asian-style vinaigrette†, or other sauce of choice. *Asian vinaigrette: For 1/2 cup, combine 2 teaspoons unseasoned rice vinegar, 1 tablespoon soy sauce, 1/2 cup olive oil or other salad oil, 1/2 teaspoon dark/toasted sesame oil, 1/2 small garlic clove finely grated. You can also add a squeeze of fresh lime juice and/or grated lime zest. †You can make your own sambal olek simply by grinding chiles with water to form a paste. We used a mortar and pestle. Nuoc cham is Vietnamese for “dipping sauce.” Nuoc mam cham is specifically a fish sauce-based dipping sauce. Whether you have kids or a sense of whimsy, this Hummus and Crudités “Clock” is a fun and good-for-you snack (photo above). We adapted the idea from a photo on the Tio Gazpacho Facebook page, and created the face of the clock from hummus. Top: Nuoc mam cham sauce (photo and recipe variation from GastronomyBlog.com). Bottom: Hummus “clock” on rice paper (photo Tio Gazpacho | Facebook). 1. SOFTEN the rice papers according to package directions. Spread with hummus and place on a plate. 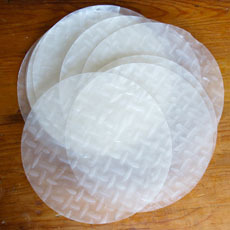 (It’s difficult to make a perfectly round clock face, so the we use the rice paper for a clean look). 2. 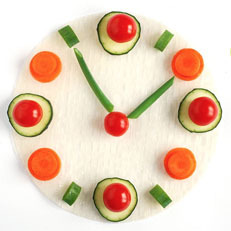 ADD the crudités as shown in the photo to make the face of the clock.